August 8 | 2018. Stockton Lake | Missouri. | Peter M. Schloss | J.D. - Mediator. August 8, 2018. Stockton Lake, Missouri. My dear wife has released me to a week of solo camping. I am on the shores of Stockton Lake, an Army Corp of Engineers impoundment that covers over 39 square miles and features over 300 miles of shoreline. 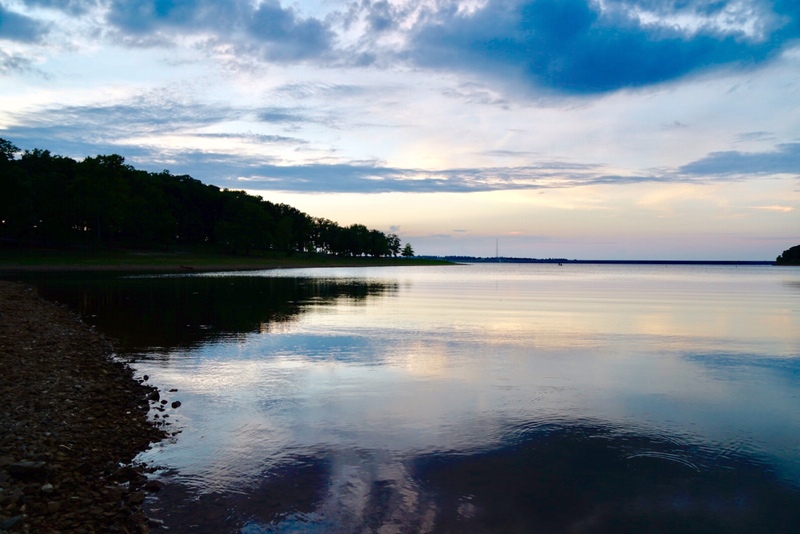 In spite of those numbers this lake ranks only 5th among the 7 largest Missouri lakes, all of which are man-made. The lake provides flood control, supplemental water for the city of Springfield, and generates up to 52 megawatts of hydroelectric power. All of these practical considerations are probably secondary (or absent) in the minds of the thousands of sportfishing enthusiasts, boaters, hikers, and campers (like me!). Christine is busily preparing to host her father’s 100th birthday celebration at our home in two weekends. We are expecting 50+ guests. As a hostess she shines. No doubt I will be helpful nearing the event, but for the next week I would only have been in her way and suffering cabin fever. We have come to recognize that we are on slightly different wavelengths when it comes to travel and being away from home. Typically, it takes Christine a couple of weeks more than me to be “ready for the road”. Conversely, it takes me a couple of weeks longer than her to be ready to “head home from the road”. Last year we found that sending me off for an occasional solo week did much to synchronize our travel libidos. I am ever looking to the future with visions of “the next thing”. We returned home on June 22nd from a 13 week journey that took in 16 countries and covered over 22,000 miles. On June 24th I began talking about Fall and Spring plans. Initially it drives Christine crazy, but it doesn’t take long for her to get caught up in my enthusiasm for our next “adventure”. Over the next few days I will speak to those plans and whatever other random stuff come to mind. I will also focus on the pursuit of two things that I am not very good at, relaxation and embracing solitude. As always, beautiful thoughts! Have fun camping! David and I can relate, already getting restless to travel, even though I have my Art Business and David has his Music. Thank you Deena. Every Season is a season for camping! Mr. negative thoughts here again. I may be wrong, but it seems to me that a man who runs off to camp alone is in a poor position to convince anyone that he has a hard time embracing solitude. Did you bring along a tag-along puppy for the trip or adopt a friendly chipmunk at the lake? Actually Steve my communications through these posts are just one of the ways that I avoid solitude. I habitually seek out human contact and interaction which may partially explain the myriad of friendships that I acquire and embrace. I would not do well as a cloistered monk. Pick up our new Casita Dec. 10. Any good camp adventures in the Winter months in the Texas/Oakla area Steve? One Of Your Blog Followers!! Thank you Tim, but most of all congratulations on the new Casita! We love winter camping in the Southwest. Big Bend National Park in Texas is a must at least once in your travels. Spend $5 and a man will row you across the Rio Grand for a day in a remote Mexican town. Both safe and legal (you will need your passport). We have also enjoyed the Wichita Mountains National Wildlife Refuge in Oklahoma. We store our Casita at the Hunt-Midwest Subtropolis underground storage facility just off Hwy 210 near Randolph Missouri. It is secure, climate controlled, and only 20 minutes from our home. Tim, are you from the Kansas City area? Pete…I am doing some “Forest Bathing” programs at the park…a way to walk in solitude in the woods and expand your sense and let the outside world go away while getting reconnected with nature…find a tree to sit by and close your eyes then expand your senses outward to “explore” your surroundings. You can also then explore your “macro” environment by looking at a square foot of ground in front of you and seeing all the life that is there…touch it, sniff it, look at it with a hand lens (or your bifocals…)…I think you will come away refreshed and relaxed! It’s remarkable, Max, how your comment dovetails with my thoughts this morning. Thanks! Pete- Enjoy what solitude you allow yourself! I think you need to meet my dad… He’s an avowed extrovert and doer to the extreme, but yet is a true cloistered monk half his time (down in Ava, Missouri).